Harold’s Club in Reno was the Nation’s best-known casino in the 1940s and 1950s, but how did that happen? Well, the story is told in much greater detail in Nevada’s Golden Age of Gambling, but here’s the start! Raymond I. Smith spent thirty years of his life running carnival games from a baseball throw to a hoop game, to a wheel of fortune, and his own fortunes rose and fell with each season. Summer was always strong, but fall stood more for a change in cash flow than the leaves that left their home in the trees. Winter was always cold, and there was no fun in Southern California or Florida, yet. There was just travel, boredom, and the hope for an early spring. His sons came along almost unnoticed. Raymond, his first son, was born in 1907, and Harold came into this harsh world three years later. Traveling from town to town, and carnival to fair, life was hard. Too hard, the son’s mother decided in 1918 and ran away with her lover to Ohio. You can run, but you can’t hide, even in Cleveland. And soon, “Pappy” arrived at the home of his soon to be ex-wife, dropped off the boys and continued with his life. His lifestyle was not conducive to rearing children, but he still provided support to the boys. When they came of age, he was willing to send for them so they could work with him for the summer. Settling in one place, Pappy took on several booths at Chutes-at-the-Beach in San Francisco. Son Raymond was not happy with the beach and boardwalk. The passing crowds were not fun or exciting, they were cattle. He soon got a job at a local bank, with civilized people. Harold saw them differently. He was driven by a great need to please Pappy. Every task was taken up with vim and vigor. Each movement, no matter how simple, would be done to perfection. He was happy to work at the beach year-round. 1928 was a boom year for Pappy, and he looked forward to an even better 1929. Since Harold had shown such a flair for the “family” business, he decided to send his son to Riverview Park, in Chicago. Arriving in the spring of 1929, Harold set about getting some new carnival games going. It was early on that Harold Smith was to learn what he conceded to be the underlying reason for his success in the casino business. He began giving away better and better prizes to his customers. He learned that you should get something for something. After the stock market crash and a failing national economy, that belief was even more important. Back in San Francisco, Pappy sent Harold to Rio Nido, a nice country setting along the Russian River that provided a pleasant summer vacation spot for many families in Northern California. Harold went to work as a Bingo operator in the summer of 1931. His first prizes were “Beacon” blankets. They were both popular, and expensive. The players were many during that first summer. Over the next four years, Pappy set up Fascination games in Florida, Whist in San Francisco, and roulette in Modesto. Changing political tides made his games legal one-day, and illegal the next. Finally, with the arrest of both “Pappy” and his son in Modesto, CA for gambling violations including the running of an illegal roulette game, he told his son it was time to try a place where gambling was legal every day of the year. That place was Reno, Nevada. Harold was interested until they arrived. No bright lights, and no big bettors, he considered it a tin-horn town. Harold studied the market and found a small Bingo parlor on South Virginia Street. He brought Pappy around and showed him the place. It wasn’t much, but Pappy decided to trust Harold’s hunch. They paid $500 to take over the lease and pay off the current owner’s debts. Then they closed up shop and began cleaning up their new store. In a long, thin room (25 by 125 feet), Pappy and his son got the ball rolling, literally, at 7:00 p.m., February 23, 1936. No fanfare went into the first night; they just opened the front door. With just the penny roulette game, Pappy and son waited for their first customers. It was not the traditional roulette wheel we know today. Harold’s Club opened with a “flasher” wheel, and it was the first in Nevada. 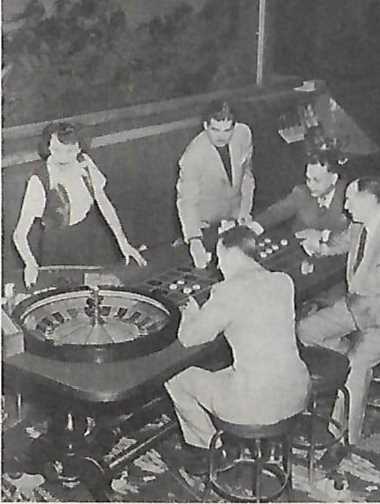 Hung from the ceiling, the eight-foot wheel spun before a large mirror, which gave each of the possible 43 players a chance to see the outcome. One game, no waiting, and the whole family got in on the act with everybody working. Soon Harold’s brother Raymond joined them, along with (believe it or not) their mother, and her new husband. By the year’s end, the books showed almost a break-even business. Profits would come slowly. The family never used an apostrophe after the “d” in Harold’s Club. 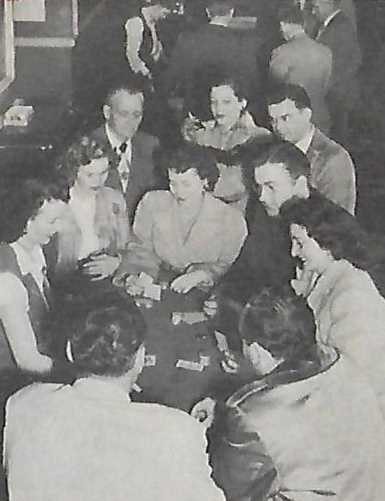 There’s much more in the book Nevada’s Golden Age of Gambling, softbound 8×11 or Kindle, with more than 70 vintage photos!